This lodge style chandelier available in 3 sizes and features 3-dimensional pine trees. The Woodland Chandelier includes Honey Onyx acrylic diffuser, hanging chain, and ceiling canopy. UL listed. Made in the USA. 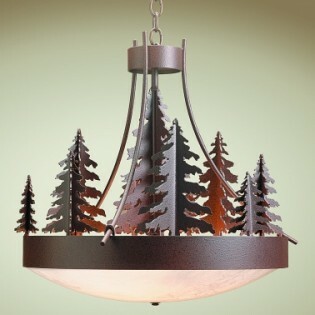 This lodge style chandelier available in 3 sizes and features 3-dimensional pine trees. The Woodland Chandelier includes Honey Onyx acrylic diffuser, hanging chain, and ceiling canopy. UL listed, Bulbs not included.